Home Skin, Hair and Nails Dandruff or Dry Scalp? The two are very different conditions but are often confused to be the same. Dry scalp is a symptom, something that can often come hand in hand with another medical condition (such as dandruff). 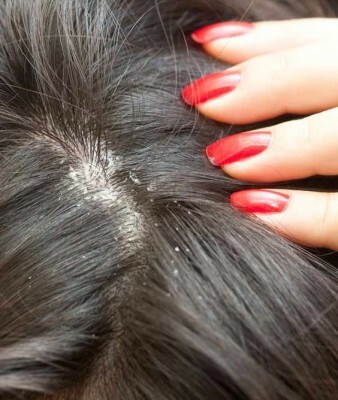 Dandruff, on the other hand, is a medical condition that isn’t pleasant for those who suffer. Dandruff is a chronic condition, one that brings ‘dry scalp’ as a symptom alongside white flaking patches, redness, irritation and itching. It can be very embarrassing for those who suffer with it and although not contagious or particular dangerous to live with, is renowned for being fairly difficult to get rid of. Many sufferers find that they have worse symptoms during the winter when the air conditioning and heating is on, plus the air is cold and damages skin, which then get better in the summer. Each case can be different also. Other skin conditions including eczema and psoriasis. There are certain factors that will put you in a higher risk bracket for dandruff. If you are a man you are more likely to suffer with dandruff than a woman, and it’s a problem that becomes more prolific with age. Having an oily scalp and hair can also lead to dandruff and a poor diet can also contribute. You should try to eat foods that are rich in vitamins, omega-3 fatty acids, calcium, zinc and potassium. If you have what is considered to be a mild case of dandruff, you’ll normally have great luck treating it with antidandruff shampoo and there are plenty of those on the market. You may need to test out a few but there’s plenty of types with varying active ingredients so it’s just a case of trial and error to work out which one will work the best for you and your symptoms. If you have been experimenting with different shampoos and treatments for more than a few weeks and you’re finding the problem either doesn’t go away or continues to worsen, it is worth making an appointment with your doctor to look at more medicated treatments. You may need to be referred to a dermatologist for a closer look and to check there isn’t another underlying problem causing your dandruff such as seborrheic dermatitis. It could also be that you don’t have dandruff at all and your symptoms are due to another skin related condition. Dry scalp is known to be a symptom, something that happens as a result of another underlying medical cause. A dry scalp can happen as a result of dandruff, eczema, psoriasis and a number of other skin-related complaints and because it’s a symptom, it’s considered easier to treat and prevent than the condition (such as dandruff) as a whole. As well as skin conditions such as psoriasis, eczema and dandruff, there are a number of reasons why you may suffer with a dry scalp. Shampooing too often is just as bad as shampooing not enough as you will be stripping your hair and scalp of the natural oils. When the natural oils are stripped, the hair follicles aren’t able to lubricate the hair growth process and this is likely to result in a number of problems, either a build up of this fluid within the hair follicles under the skin, or as dry skin on the surface, often with white and silvery flakes that are easily shaken off onto clothing. In fact, the same things that can cause dandruff can also cause a dry scalp which is what makes them similar and often why people confuse the two. Exposure to hot and cold temperatures can have an effect on the oil production which in turn can lead to dry skin, and continued exposure to sunlight, heated styling tools and bleaching can damage the hair and scalp as well as over-styling, tight ponytails and more. If you have a dry scalp, the best thing you can do is to give your hair a break. Don’t wash it for a couple of days and definitely do not use heated styling tools or hair products such as mousse, hairspray and dry shampoo. You need to give your scalp a break because when the scalp isn’t healthy, the hair growth won’t be healthy either. A daily multivitamin can help to speed up recovery of the hair follicles, hair growth and scalp and you should particular look out for supplements that contain vitamin B, zinc and omega-3 fatty acids and at the same time, make sure you’re drinking plenty of fluids to rehydrate the area. Generally, because a dry scalp is a symptom that comes with other conditions, treatment is relatively quick and simple. It’s a case of working out what is causing it and then taking treatment or preventative measures from there on. If the problem persists, it could be that you have dandruff and if using specially formulated shampoos doesn’t appear to make it go away, a trip to the doctor or skin care professional will help. If the problem goes away after a couple of days with some cleaning, drinking and dietary changes, it’s probably just a dry scalp.